While the tourism infrastructure of Costa Rica is excellent, there still are many hidden treasures that have slipped through the cracks of mainstream tourism. Many of these gems are simply located along routes with small overgrown signs that many pass by without a thought or second glance. Others are located near larger tourist destinations and simply overshadowed by all of the hoopla. Whatever the case, we have made this section for those of you that like us enjoy the stops along the way that can turn a great vacation into an amazing trip of a lifetime. 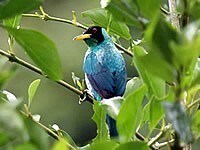 Click the links to read about Costa Rica hidden treasures. Few places in the world are as strikingly beautiful as the Rio Celeste Waterfall. I once brought my wife there and she immediately burst into tears at the natural beauty of this waterfall. The color of the river is a Kool Aid blue and the surrounding rainforest is emerald green. The combination and contrast of these colors creates an astoundingly gorgeous natural setting. Click on the link to read more about this Costa Rica hidden treasure. The Tree of Life tour is located down in the jungle lined mountains of the south Pacific between Dominical and San Isidro. The tour starts off with a difficult hike straight up a mountain. Along the way, your guide will point our medicinal plants and explain how the indigenous used them. When you reach the top, you will approach a gorgeous double waterfall with a cave behind it. The family that owns this property has installed bedding, a fully functional kitchen and bathrooms. The truly is an amazing, one of a kind hidden treasure. Click on the link to learn more about the Tree of Life. 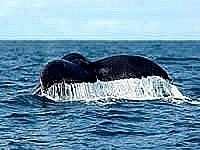 The words, Costa Ballena translate to Whale Coast. This is an area located along the southern Pacific coast between Uvita and Dominical. 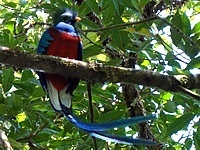 Most of the area is protected within Marino Ballena National Park. This marine park was created with the intention of protecting whales, dolphins and other marine life. Humpback Whales visit the park annually to raise their calves. 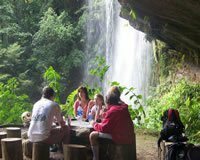 Click on the link to learn more about this amazing Costa Rica hidden treasure. 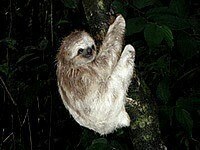 Aviarios Sloth Sanctuary is a family run facility located just north of Cahuita on the Caribbean coast. The family that owns the sanctuary has dedicated their land and home to the protection, research and rehabilitation of sloths. One month stays can be arranged for volunteers to assist with the sanctuary projects or visitors can pay a reasonable entrance fee for a day pass which includes a guided canoe ride through mangroves behind the center. Click on the link to read more about Aviarios Sloth Sanctuary. The San Lorenzo Cloud Forest is one of the most traveled through, but overlooked cloud forest areas in Costa Rica. The forest is located between San Ramon and La Fortuna, so most visitors to Arenal Volcano drive through the forest and do not even realize it. The San Lorenzo Cloud Forest is a beautiful place with plenty of wildlife and excellent birdwatching including annual migrations of quetzals. Click on the link to read more about this Costa Rica hidden treasure. Loacted high up in the cloud forest of the Talamanca Mountains, San Gerardo de Dota is one of the best places in the world for highland birdwatching. 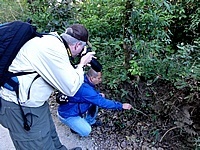 Dedicated birdwatchers come to this area from all over the world in hopes of spotting exotic species such as the resplendent quetzal, bell birds, emerald toucanettes, hummingbirds, trogons and tanagers. 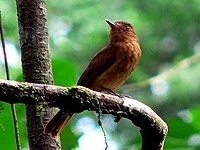 Click on the link to learn more about San Gerardo de Dota birdwatching. The Childrens Eternal Rainforest is a rainforest and cloud forest area located between Arenal National Park and Monteverde Cloud Forest Reserve. This is an area of tough terrain and vast contrasts in elevation. The purchase of the private reserve was funded mostly by school age children who collected pennies in milk containers in the 1980s. Click on the link to learn more about this incredible Costa Rica hidden treasure. Playa Nancite is a remote beach located within Santa Rosa National Park in northwest Guanacaste. 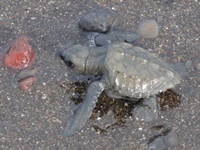 The beach is mostly known for the Olive Ridley turtles which nest here in incredible numbers. During an arribada, there can be tens of thousands of turtles on the beach. This is an amazing sight and only surpassed when the millions of baby turtles hatch 45 days later and make their way to the sea. Click on the link to learn more about Playa Nancite. The Rio Tarcoles borders Carara National Park, just inland of the Central Pacific coast a little north of Jaco. The crocodiles that inhabit the waters of this river have grown to mammoth size, up to 18 feet long. Many passersby collect on the famous Rio Tarcoles Bridge to catch a glimpse of the enormous crocs. Click on the link to learn more about Rio Tarcoles crocodiles.